Oil painting has always been my first love. This time I’ve decided to do a big canvas, 24 inches by 36 inches, to be filled with exuberant brush strokes and lots of colour. 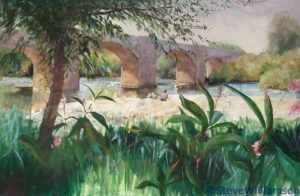 I tasked my students to paint a bridge, largely because I had been looking through my references for paintings in my book, “The Bridges of Dee”, and found some photos that I felt had potential. The subject gives plenty of options for texture with stone or brickwork, water either still or flowing, greenery perhaps. In the book, I showed the old bridge at Bangor looking up stream and against the sun. This gave a lovely pearly quality to the appearance of the stonework and allowed the light reflecting off the water to illuminate the underside of the bridge – great fun! This new painting is of the same bridge but painted from the other side with the sun is full on the face of the bridge and the Church Tower adjacent to it. The sky is bright blue with fluffy clouds. In fact it’s a very traditional landscape and none the worse for that. 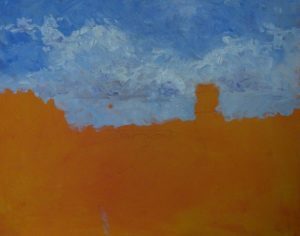 Before you ask, I often paint my canvas bright orange before I start the picture. It is so invigorating! and a great foil for the blue of the sky. As you can see, I’ve really enjoyed myself with the brush. It will be interesting to see how the two pictures contrast!